Close to 90% of the Polish population is Roman Catholic. Pictured is Wawel Castle, where Pope John Paul II presided before becoming Pope in Rome. The past couple of weeks have been so very hectic. First, my magnificent adventures in Morocco–then just three days later Amsterdam and now another weekend away from Leuven. This time we headed east towards the cities of Warsaw and Krakow in Poland. We landed late on a Thursday night in Warsaw and the moment we got off the plane we immediately felt the biting cold and the strong wind. Our group took a bus from the airport to the train station where we waited about an hour to wait to board an overnight train to Krakow…this is where things got interesting. There were eight of us traveling together and we were spread among seven different compartments. I was fortunate enough to be in a compartment with one of my friends but, still, when we found our seats we were the only girls with four guys. Since it was so bitterly cold outside, one of our compartment-mates had the idea to turn the heat on as high as possible so I spent the night taking off my jacket, followed by my scarf and sweater. I finally was able to get some sleep and was awoken at around 4am to a woman screaming in Polish in my compartment, wearing a fur coat and stiletto heels about 4 inches high. She seemed very out of place among all the other travelers. I’m not exactly sure what she was saying but as she jumped across me and out the door and down the hall, I figured she missed her stop. We pulled into Krakow around six in the morning and we jumped on a tram and made our way to our hostel where we were politely informed that check in wasn’t until 11am. After food and coffee, things seemed to settle down and we had a very nice morning. We walked to the center square in Krakow, which is the largest square in Europe, and explored the cloth market vendors and a majestic, beautiful church. We then walked in the direction of our hostel and visited the Wawel Castle. Wawel Castle is perhaps most well-known for its cathedral, where Pope John Paul II presided before becoming Pope in Rome. We were unable to see the famous dragon that is supposed to guard the castle. But, we toured the breathtaking, grand state rooms–but we were all getting quite tired so we walked the quick walk back to our hostel and took a nice, long nap. When we woke up later in the early afternoon, our group made our way to a bus stop and headed out of the city to visit some of the salt mines that reach depths of over 100 meters below the ground. The salt mines are comprised of a series of tunnels that connect cavernous rooms, even churches and chapels, all under the surface. There are several underground lakes, one of which is used for medicinal purposes due to its constant temperature and dry humidity. There are sculptures, chandeliers and altars constructed entirely of salt. As if our guide thought we didn’t believe her, she advised us to lick the walls just to prove how truly salty the mine is! The mines were unlike anything we had visited before and the temperature (which was constantly in the mid-50s) was a very pleasant break from the frigid temperatures above ground. 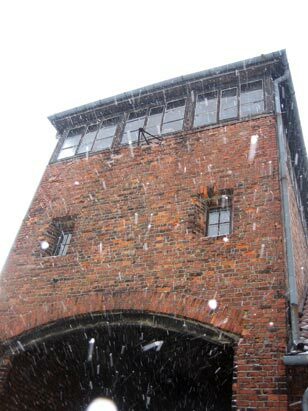 The Gate House at Birkenau, also known as the Auschwitz II concentration camp. Saturday was an incredibly somber day and one that I will not forget for a long time. Infamous for the cruel treatment of the prisoners that arrived by train through the now, universally-recognized gates and watchtower, we visited the concentration camp of Birkenau, also known as Auschwitz II. The former camp now serves as a museum to educate the public about the atrocities that occurred during the Second World War, as well as a memorial for the millions of lives that were lost during the Holocaust. It is difficult to put into words what it was like to be in a place that serves as a grave for so many innocent souls. But, I must comment on the thoroughness and the extensive knowledge of the guides who lead the three hour tours. Our guide was able to describe the horrendous and inhumane conditions of life in the camps, and what the experiences of the prisoners would have been like. As we saw the rubble of the crematoriums and entered the barracks in which the women of the camp lived, I believe we all experienced a sense of disbelief that such acts occurred. Much of the camps remain intact. As disturbing this reality and piece of world history is, I support the preservation of these areas so visitors can be reminded that such crimes should never be allowed to occur again to mankind. Poland differed from other trips of this semester, but it most definitely stands out to me as one of the most important trips I’ve been on in my two semesters abroad. The historical context of the trip reminded me that, while I want to have as much fun as possible this year abroad, there is more to relish and learn from my study abroad experience. It is so important to me that I learn more about this fantastic world in which we live and understand what has shaped European culture and history. I am very much looking forward to my upcoming adventures to Budapest and Prague—there is no telling what these last few months hold for my two amazing semesters abroad that have offered me an education of a lifetime.